I want to find a auto shutdown program for a girl , and I finally found this one. Wise Auto Shutdown is clean and easy to use. No more function but meet the basic requirement. So I think it is so nice and fit for girls. When I set it to "From now", it shows the wrong time here. 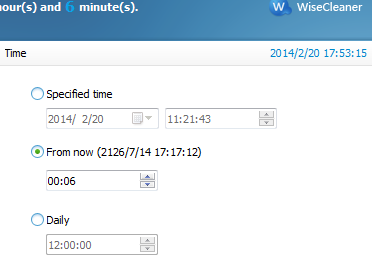 Now, it is 2014, but here shows 2126, and the month and the day are also incorrect. I am using Win 7 64bit, and the version of Wise Auto Shutdown is 1.38.66. I'm in China, in timezone UTC +8, hope these would be helpful. Hopefully, someone from Wise will read this thread within the next few days and respond accordingly. I have no idea how this got passed the final review. I do not work for Wise. Version 1.36.64 didn't have this problem.